A regular keyboard is sure to provide the basic comfort for computer management and navigation, and there’s even a button to capture the entire screen activity as a picture. Chances are you want the whole screenshot operation to go smooth, and for this to be possible, it’s a good idea to rely on applications like Capture, Crop & Stitch. Capture, Crop & Stitch is a compact tool that lets you capture images and edit them by flipping or cropping. You can also rotate the images and combine several files.You can use the program as a basic image processing that allows you to select a part of the image and crop the selection. With Capture, Crop & Stitch, you can capture activity on the screen with the possibility to crop, rotate, and even stitch other pictures with the help of this application. There isn’t even a need to go through a setup process, which means the application is portable. As such, it’s easy to carry around on a thumb drive to have a practical screenshot tool at hand, regardless of the computer you’re using. Registry entries are not put at risk, so the health status is not affected. 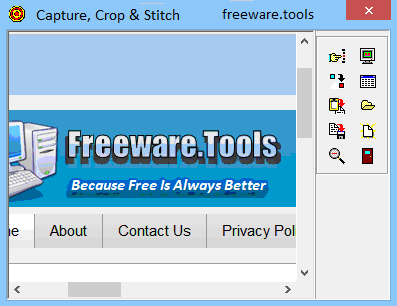 The application includes various components, making it a screenshot grabber and editor into one. Most of the space is where the screenshot preview is provided, while additional controls are found in a side panel. These consist of different value fields for flip and crop, and it’s possible to load existing pictures to stitch them together. You rely on the keyboard print screen button to grab a screenshot. It immediately shows up in the preview area. It can then be saved as a picture of formats like JPG, BMP, or PNG, which are also supported as import options for in-depth management of pictures. Edit operations aren’t abundant, and mostly consist of means to crop and stitch pictures together. The preview area provides real-time feedback of all fields you edit. It might take some time before you can easily edit all values, which also include a rotate function. All things considered, we can state that Capture, Crop & Stitch is a straightforward tool which combines a little bit of the Paint tool with the print screen function.